YELLOW (ADFR): This bit must be set for the ADC to run continuously (free running mode). PINK (MUX0-MUX3): These four bits are for telling the input channel. Since we are going to use ADC0 or PIN0, we need not set any bits as by the table. BROWN (ADPS0-ADPS2): these three bits are for setting the prescalar for ADC. Since we are using a prescalar of 2, we have to set one bit. 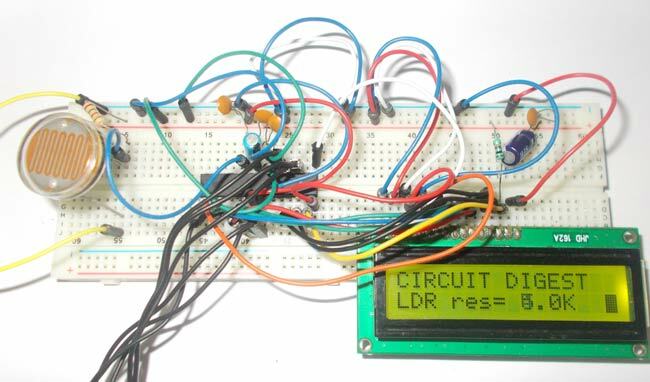 So with resistance of LDR on the 16x2 LCD screen, we can match it with LUX graph for getting the light intensity. DDRC = 0;//Taking portC as input. // Now since it’s a 10bit ADC for every Vref(5V)/1024=5mV(4.88mV) we get one digital increment or for every 1V increment in input we get 204.8 count increment. So for finding voltage at ADC pin. send_a_command(0x80 + 0x40 + 8);//retuning to second line 10th shell. Thank you so much.....for such a detailed article. It was very simple to understand. Hope to see more like this. God bless you. I am getting few errors while compiling the code .Please correct the code . Very urgent . I want to know how to interface ldr with lpc2148. Can u send me the code..? Why did you put PORTA=0, if this one is not used? What did you mean with that. I am getting errors when compiling the code because of that line.